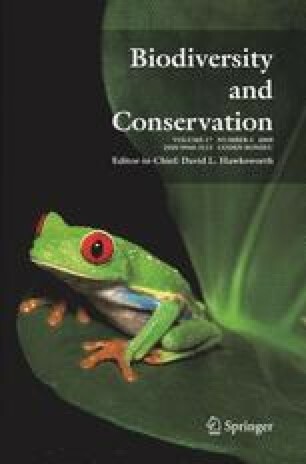 Production landscapes are rarely considered as priority areas for biodiversity conservation in the tropics. Tree plantations have the potential to provide a conservation service in much of the humid tropics since they are rapidly increasing in extent and present less of a structural contrast with native vegetation than many more intensive agricultural land-uses. We used hierarchical partitioning to examine the factors that influence the value of large-scale Eucalyptus plantations for tropical fruit-feeding butterflies (Lepidoptera: Nymphalidae) in the Brazilian Amazon. We focused on evaluating the importance of landscape versus stand-level factors in determining the diversity and composition of butterfly assemblages, and how butterfly-environment relationships vary within and between subfamilies of Nymphalidae. Native understorey vegetation richness had the strongest independent effect on the richness, abundance and composition of all fruit-feeding butterflies, as well as a subset of species that had been recorded in nearby primary forests. However, overall patterns were strongly influenced by the most abundant subfamily (Satyrinae), and vegetation richness was not related to the abundance of any other subfamily, or non-Satyrinae species, highlighting the importance of disaggregating the fruit-feeding Nymphalidae when examining butterfly-environment relationships. Our results suggest that plantations can help conserve a limited number of forest species, and serve to highlight the research that is necessary to understand better the relationship between fruit-feeding butterflies and environmental variables that are amenable to management. We thank the Brazilian Ministério de Ciências e Tecnologia (CNPq) and Ministério do Meio Ambiente (MMA-IBAMA) for permissions to conduct this research. We are very grateful to Grupo Orsa and the staff of Orsa Florestal and Jari Celulose S.A. in Monte Dourado, Brazil, for permission to work in their landholding, as well as logistical support throughout the duration of the project and for making the plantation dominant height data available to us. The project was funded by the UK Government Darwin Initiative, National Geographic Society, Conservation Food and Health Foundation and Conservation International. This is publication number 11 of the Land-Use Change and Amazonian Biodiversity project.